My love for goats goes way back, and I’m not sure where it originated, since I didn’t grow up in a farming community. Perhaps it was from reading Heidi? Living on the farm, I quickly made plans to find some goats. After some research I decided that Kinder goats would be the way to go. I liked Nubians, but I wanted something smaller. Kinders are a cross between a Nubian female and a pygmy male. The next step was to obtain some Nubian females. There were a couple of Nubians in Newfoundland looking for a home, and I had them transported to Nova Scotia. Esther and Dottie West came to Turtle Hill in 2002, and I was thrilled to finally have some goats! Now, to find a husband for them. I had to go all the way to Alberta to find a registered Pygmy goat that I liked. Tonga arrived none the worst for wear, and happily settled in with the females. However, he was so small! Tonga, the tiny pygmy buckling as a newborn baby. A boy and a girl, Esther's last babies. This photo shows Zydeco and Willow Bay, Esther’s only kids born at Turtle Hill Farm. 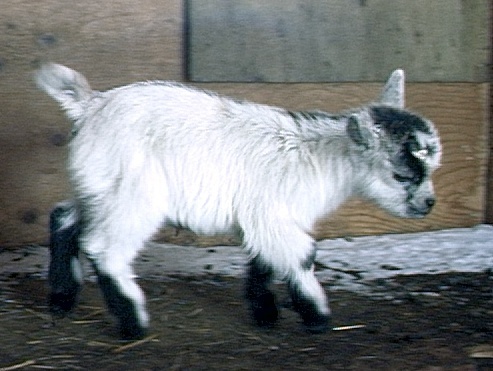 The buck was Morning Star Macho Man, a Nigerian Dwarf goat. 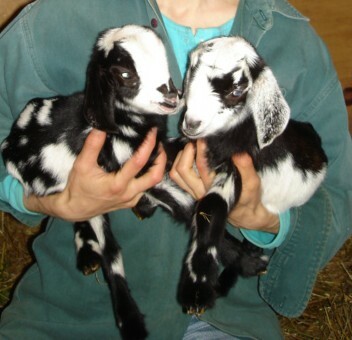 Nigerians are crossed with Nubians to produce the mini-nubian breed, and with other dairy breeds to produce minis in their breed, such as mini-toggenburgs, mini-saanens, etc. The goal is to produce a small dairy goat that will keep the qualities of the dairy breed being mini-fied, in terms of apparence, milking quality, conformation, etc. The same as the named breed, only smaller. The benefits of having a smaller dairy goat is that they are easier to handle, cost less to feed and house, require smaller grazing pasture, and so on. Lots of people have them, you have to decide on what you want and start searching! I’m in Gaspereau and we are interested in Kinder goats for our little homestead. Are you breeding to sell? Please get in touch! sounds like there is some demand out there for goats? is that an avenue for you?